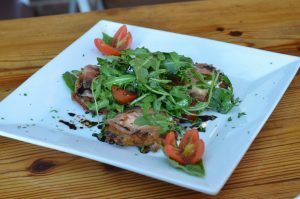 Fried green tomatoes topped with herb goat cheese, prosciutto ham and arugula tossed in a roasted tomato vinaigrette. North Carolina rainbow trout encrusted with Georgia pecans and herbs, served over roasted butternut squash, greens, pesto and balsamic. 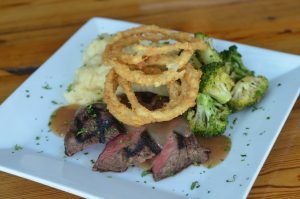 Certified Black Angus Flat Iron in a Jack Daniels marinade with mashed potatoes, broccoli and onion straws. Join us for lunch or dinner and enjoy the flavors of fall with a Greek twist.